Acreage calculator - how does it work? 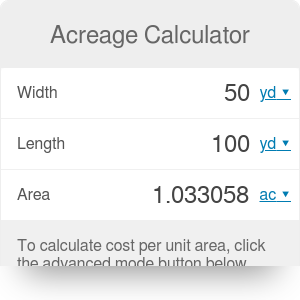 Acreage calculator helps you measure a piece of land or quickly convert between imperial and metric system's units. It can be useful when working out the total area or cost of specific materials that have to be used to cover the given land. Simply provide a width and a length and you'll get an area. Optionally, provide a price per unit of area (for example how much that land costs per acre) and you'll know what's the cost of the whole. You can also convert hectares to acres, acres to square meters, acres to square miles or pretty much any other unit of area. and even millimeters and nautical miles! Other tools that can be used for similar operations are square footage calculator and area conversion tool. This tool can also quickly convert hectares to acres based on the provided values. Simply click on the 'a' (acres) and from the drop-down list choose 'ha' (hectares). It's not a straightforwards operation as 1 acre equals 0.4047 hectares but results are still returned in real time. Another possible conversion is acres to square meters, it is another convenient option on the drop-down list. Simply type in your result in acres (or calculate it based on width and length in any unit). Change the unit to acres then and see the ready result. You might be also interested in converting acres to square miles. It can be also achieved by changing a unit in the drop-down list. Assessing acres to square miles without any calculator is also quite complicated as in case of acres to square meters or hectares to acres. 1 acre equals 0.0015625 miles. Acreage Calculator can be embedded on your website to enrich the content you wrote and make it easier for your visitors to understand your message.